Texas BBQ Goes Vegan! (Well, Kinda Sorta)- Introducing #BBQProject2020– a new Initiative for All #BBQ #Restaurants to offer #Fresh #Veggies from the #Grill by year #2020. 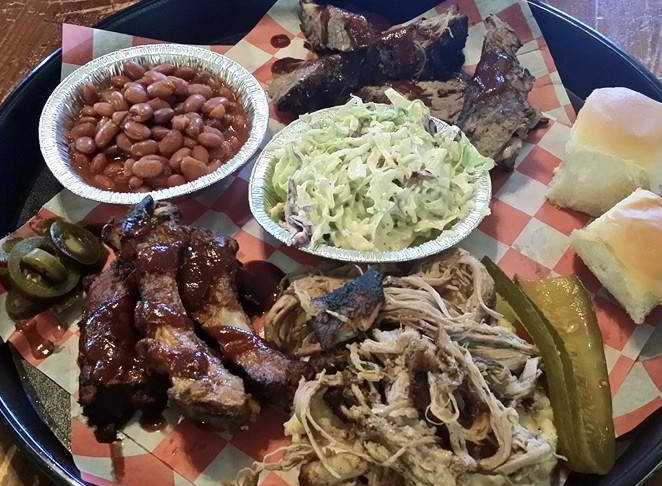 This Video shot at Brown B Que Restaurant in Austin, Texas shows how it can be done. Special Thanks to Thurman, Claudia and Kenneth Brown (Long Lost Cousins). The brave folks at Brown B Que in San Antonio were adventurous enough to cook a #Vegan Dish on a 40 year old Smoker, that had never met a Veggie before. Stay tuned for their surprising reactions. Special Cameo by Chef Mick Brown’s #Mom. Hope you enjoy! 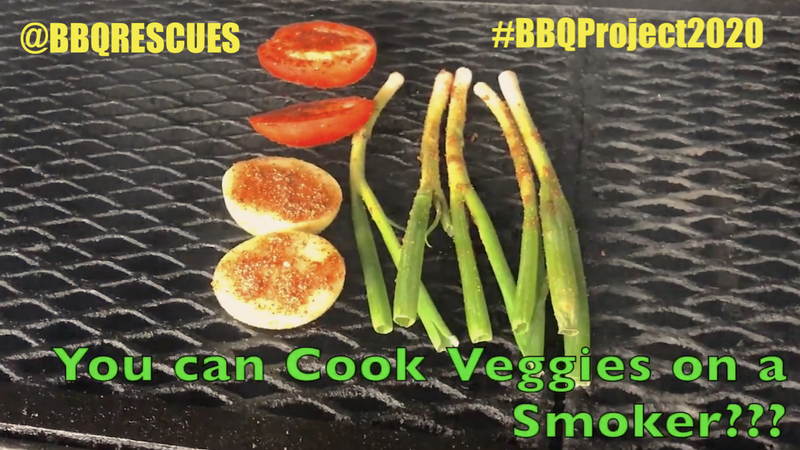 Smoke Veggies on Hickey, Mesquite or (your favorite) Wood Smoker for 15-30 Minutes. Remove Veggies from Smoker. Chop into 1″ portions. Season Potato with BBQ Rub, add Chopped Veggies on top. Finish with a drizzle of BBQ Sauce and final dusting of Rub. Chef Mick Brown at Relay For Life benefit for American Cancer Society- Bridge To Life table, Griffith Park (Los Angeles) May 2016. May 16, 2015 with On Air Personality Paul Freeman of Go Country 105 FM at American Cancer Society’s Relay for Life at the Autry Museum, Griffith Park. Whether you have been before or not, the people at Relay For Life always make you feel right at home. For the fourth year, I will be doing Cooking Demonstrations and Samples from 9am-11am. This year’s sales of HEROIC! will benefit the ACS and the new BBQ RESCUES! Foundation. That’s why I always look forward to going “Home Again”. See you there. 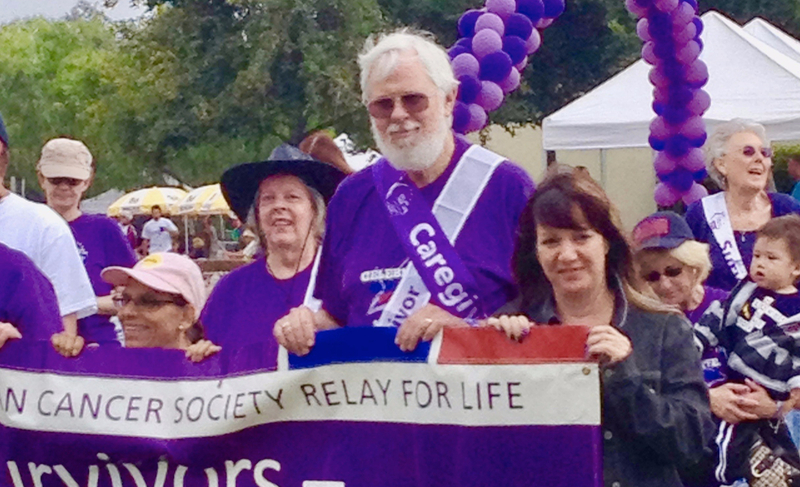 Chef Mick Brown at American Cancer Society’s Relay For Life at the Gene Autry Museum, Griffith Park June 2013. Did you know that a small portion of the cash that you spend every week on Fast Food could make a big difference in your Community? The Netherlands just had an 81% Voter Turn Out! That’s a huge number for any group of people to participate in anything. Could you imagine if only 20% of the what we spent in the McDrive Thru went to our favorite Causes? What if you invested 50% of the Eating budget into your biggest asset- Your Good Health? What does this have to do with BBQ? Or Food Event Fundraising? Read on. Chef Mick Brown helping serve lunch to 500 people at the Santa Monica Police Dept. 120th Birthday BBQ in 2016. For those around the rest of the country, BBQ RESCUES! will try to share as many Tips as possible. I also am honored to have been invited to headline a Children’s Charity benefit BBQ Cookout in Houston, TX. on Sunday March 26th, 2017. This will be the first run of a new program where we will travel the country teaching BBQ Food Fundraiser Bootcamps to Charities, Schools, and other worthy Organizations. The first part will be teaching Recipes and Fo0d Safety Tips to Volunteers. Then invited Guests will arrive later to dine on the foods we prepare as they receive a Cooking Demo on how to prepare the dishes at home. 1. Check Local Laws regarding Food Fundraising Events. One time, Non-Profit events usually do not require paying for the permit, but may still need to register the responsible Certified Food Professional involved and required Proof of Insurance. Laws may vary depending on whether food is served privately to invited Guests, or advertised and sold to the General Public. Some Jurisdictions also make distinctions between Baked Goods, Prepared Ready to Eat Products, and serving Potentially Hazardous Foods. 2. Set Date, Time, Budget and locate an appropriate Venue. Once again, most jurisdictions simply require the supervision of a Food Professional and Potable Hands Washing facilities. So consider whether you need to rent a Church or Commercial Kitchen venue or can do it in the Park and in a volunteer’s Backyard. 4. Pre-Planning is Crucial. Whether you meet by Phone, Skype, In Person or stay in contact via Email, it is important to think through each step of the Event, and assign who is responsible for completing it. First timers, be careful of piling too many tasks on one person. Good Intentions are not enough when it comes to Serving Food Safely. Try to prepare all Volunteers well in advance, so everyone is not starting from scratch getting instructions during event. It is always helpful to prepare detailed Itinerary . 5.Day of Event- Start Early. Do not underestimate how much time it will take to get from Preparing All Food, Doing Set-Up and Coordinating Event Staff prior to receiving Visitors. Remember you always want to bring your “A” Game, when it comes to serving Delicious Food. Most potentially Hazardous Pre-prepared Foods have a 4 Hour Window to be held and served at proper temperatures. 6. Try to Have Fun! Nothing stresses Customers out more than seeing frantic, disorganized conflicts going on with the Cooking Staff. That is why people are regularly walking on the TV Show- Hell’s Kitchen. Everyone is at the Event to support your Charity so make sure they have a Good Time. They will request you to do it again and again, and you will see your Following grow, along with your Club Finances. Don’t forget to add plenty of Grilled Veggies to the Menu, to help balance off some of the Meats. Pictured: Chef Mick Brown grilling Corporate Lunch in Griffith Park, Los Angeles. Join us for a special Sunday Night BBQ Cookout to benefit Great Inspirations For Teens (GIFT) and Our Children Our Future (OCOF) of Houston, Texas. The event, “GIFT us Your McFastFood Money (#GYMM) will be held on Sunday March 26th, 2017 at 4pm, will feature a Dinner prepared by the Teens with the help of visiting Chef Mick Brown- Host of BBQ RESCUES TV. They promise a delicious and nutritious Menu on a Pay-What-You-Can basis. Also, we will demonstrate how your family can make the Meal at home, for a half of what you’d normally spend on Fast Food. Would you like information on Sponsoring or Hosting a BBQ Food Fundraiser?